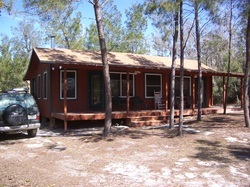 An amazing retreat on Big Grasshopper Lake in the Ocala National Forest. Sit on the dock and watch amazing sunsets, then enjoy a cozy evening in front of the wood-burning fireplace. 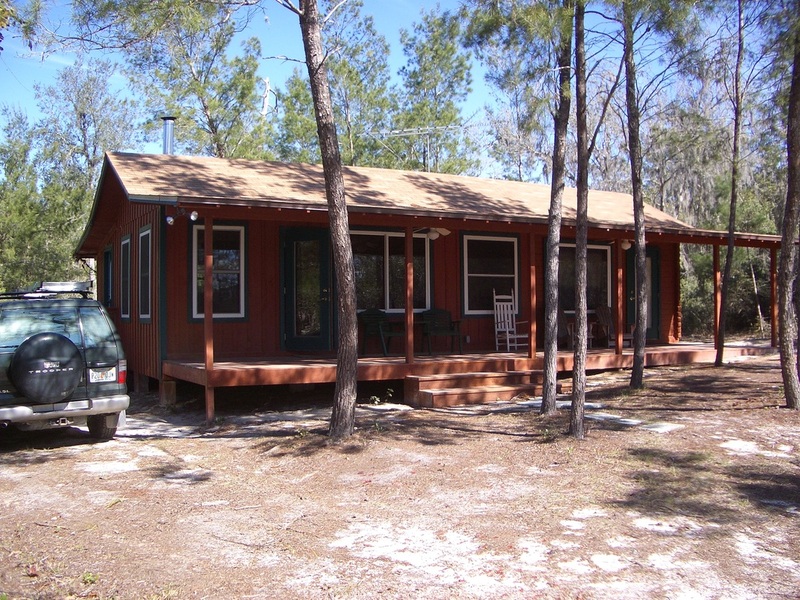 Go hiking, canoeing, fishing, birdwatching in the Ocala National Forest, and then have dinner prepared in the gorgeous, fully-equipped cedar kitchen. Crafted from all-local wood, the cabin features cypress floors, knotty sand-pine walls and ceilings, cedar doors and trim. Spacious great room and open kitchen facing Big Grasshopper Lake. Bedroom features Sealy Posturepedic King Size bed with rustic cedar headboard. Totally secluded - built on an old in-holding that was privately owned when the Ocala National Forest was created, this property is part of a 40 acre parcel that remained private when the ONF was created around it. Our cabin sits on a corner of the parcel, surrounded on two sides by the ONF. It is the ONLY house on an extensive chain of lakes that offer incredible recreation and wildlife viewing opportunities. Totally rustic, yet with all the amenities - fully equipped kitchen with microwave, dishwasher, disposal, washer and dryer, TV and home theater in living room and bedroom, ceiling fans, screened porch. Only 50 miles from Orlando, and 40 miles from Daytona Beach. Use it as your base to explore all that Central Florida has to offer, or come and recharge your batteries in the serene wilderness.